Lumber exports from B.C. to China are hitting record levels. Recent trade figures show that the value of softwood lumber exported to China has surpassed the U.S., a powerful signal about the importance of Asia Pacific lumber markets. 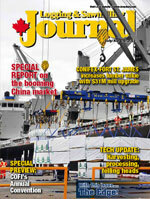 Logging and Sawmilling Journal takes a look at the China lumber market in a special supplement beginning on page 36 of this issue. (Cover photo of B.C. lumber being loaded at the Lynnterm facility of Port Metro Vancouver by Rob Stanhope). The recently created Northwest B.C. Forest Coalition is taking a co-operative approach to marketing the region’s forest resource—the province’s largest uncommitted wood basket—and the response to date has been very positive, with a number of interested parties. New Tigercat equipment and an innovative business approach have reinforced Alberta logging contractor Jesse Bowman’s focus on a productive, satisfying and safe work logging environment. A $31 million upgrade at the Fort St. James, B.C. operation of Conifex is delivering more higher valued lumber products—and resulting in a smoother, more efficient product flow. The COFI convention is back! The COFI annual convention is back, and Logging and Sawmilling Journal is the Official Show Guide: Read all about the convention, being held September 15 to 17 in Prince George, and how the recovery of COFI’s lumber producing members is benefiting almost all types of businesses in British Columbia. China: It’s the single biggest reason for the recovery of the B.C. forest industry and Logging and Sawmilling Journal takes a look at this booming market, and how to meet the needs of customers. Florida-based Suwannee Lumber needed to find a way to handle dense, heavy and pitchier Southern Yellow Pine through its sawmill. The solution? Bring in the Canucks, in the form of Bosch Rexroth Canada and its MAC-8 control system. Included in The Edge, Canada’s leading publication on research in the forest industry— now incorporated into Logging and Sawmilling Journal—read all about research projects related to Canadian Wood Fibre Centre/Natural Resources Canada, Alberta Innovates-Bio Solutions and FPInnovations. Logging and Sawmilling Journal has the latest information on what’s new in harvesting, processing and felling heads in this issue’s Tech Update. Forest companies on the British Columbia Coast are now finding many opportunities to increase efficiency and expand markets using the area’s abundant hemlock and amabilis fir resource, resulting from research conducted by FPInnovations as part of the five-year, BC Coastal Hem-Fir Initiative. The initiative is a partnership involving the coastal forest industry, FPInnovations, the federal government, and the B.C. government. It is now in its fourth year. “We have a steering committee with representation from industry, the Coast Forest Products Association, Forest Innovation Investment (FII), the provincial government and the federal government guiding our research,” says Tim Caldecott, FPInnovations project manager for the Initiative. So far, industry adjustments made to sawmilling, forest management, and investigation of new products has yielded about a $36 million benefit to the industry, with the long term goal being in the $150 million range. That amount is based on feedback from industry about changes that they have implemented based on work FPInnovations has conducted or actual trials that have resulted in real cost savings or margin improvements. For example, a program that resulted in adjustments to sawmilling programs at some coastal sawmills allowed the mills to produce higher value decking from a standard 2 X 6 that is now being sold for about $2000 per mbf. A closer look at some individual research projects shows to what extent industry has benefited from this partnership, the focus on implementation and what new doors have been opened. 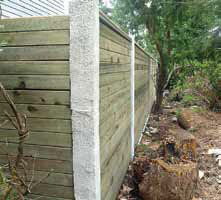 In the Products & Markets Program, the initiative has not only provided industry with the potential to produce a highly lucrative decking product, but has demonstrated how the hem-fir resource could be used in sound abatement products such as fencing and sound barriers as a green alternative to concrete. Trials and scientific testing show that it is a viable product for both residential and industrial use. The cost of installation is also considerably lower than concrete. FPInnovations is working with several B.C. Ministries to possibly install a demonstration project, to show its potential as a viable alternative. The hem-fir timber market in building construction has also been identified as a significant market opportunity, particularly in shorter, highly visible applications as a complement to glue-lam. In the Harvesting & Conversion Program, trials of a ‘simple scaling’ method for transporting logs showed the potential for savings of $0.24 per cubic metre using this method as compared to other alternatives. If 25 per cent of coastal second growth, hem-fir sites adopted simple scaling, cost savings would amount to about $300,000 per year. On some sites, the savings could be as high as $0.50 per cubic metre or $600,000 per year on volume of 1.2 million cubic metres. In the sawmill, FPInnovations’ LogWorth software tool was implemented in four B.C, coastal sawmills. It helps to plan cutting programs by assigning costs and prices to determine whether a new cut program would generate a positive financial return. By using the software, mills are able to reduce their costs to test new products and are also able to design cutting patterns for different sized logs, thus speeding up implementation of new cutting programs and reducing costs. “The anticipated gain of this year’s work involving our partners’ use of LogWorth is $200,000 per sawmill per year,” says Caldecott. Also, a variety of scanners were tested for scanning hem-fir for value. One immediate opportunity that researchers discovered was to scan for wet pockets at the board level. The biggest economic impact of wet pocket detection is freeing up kiln capacity by identifying lumber with wet pockets to be sold as green. Researchers have also developed a tool for modeling the drying of hem-fir timber to predict drying times and final moisture content distribution. Previous work on optimizing drying has resulted in over a $1.5 million per year gain in product improvement and savings on drying costs. In the Bio-energy and Bio-refinery Program, Caldecott says one promising area that researchers are investigating is conversion of hog material into bio-oil using the pyrolysis process. The most recent findings indicate that the salt component in the hog material appears to reduce the amount of bio-oil produced, but research is continuing in this area to determine the size of the opportunity. The initiative’s research program has undertaken projects along the entire value chain from the forest resource to marketing of final products, looking to benefit all sectors of the coastal forest industry including manufacturers of solid wood products, pulp and paper, and panel board, as well as those looking to invest into the growing bio-economy. Researchers are now using genomics to enhance assessment of the mountain pine beetle risk. The eastward spread of the mountain pine beetle has surprised many, and that is one purpose behind the ‘Tria Project’—use groundbreaking gene technology to better understand the complex relationship involving the beetle, pine trees, and the fungi that contribute to tree mortality in an attempt to remove that element of surprise. “In 2006, with the sudden arrival of the mountain pine beetle in the Peace River area and the notion that it had traveled long distances to get there, that really said to us that we needed to adjust our views of what the beetle is capable of,” says Dr. Janice Cooke, assistant professor of biological sciences at the University of Alberta and Tria Project team member. That unanticipated beetle migration into new environments continues today with the recent discovery that the beetle is now established in pure jackpine stands in eastern Alberta. For Tria Project team members, it came as no surprise, based on the knowledge they have gathered over the past four years about the beetle’s spread. Cooke and her colleagues are using the science of genomics to better understand the processes in pine trees, the beetle and beetle-associated fungi matter when it comes to the spread of the beetle, and whether those processes vary genetically. Genomics is the high throughput science of analyzing many genes and/or many samples all at once, rather than studying individual genes or small numbers of samples. In this research, genomics is being used to discover processes that could affect mountain pine beetle spread, and identify genetic signatures of adaptation in the beetles, fungi, and trees over the outbreak region. “It really means that instead of trying to pick needles out of a haystack, you use a hay comber to go through that haystack to find those needles,” says Cooke. Her laboratory at the U of A is particularly focused on using genomics to better understand the processes that occur within pine trees and their influence on the beetle and fungi. Overall, she says that the discoveries using genomics by Tria Project researchers are filling knowledge gaps for individuals and organizations that build environmental risk models that can be used to predict the risk of a beetle outbreak spreading. Project researchers are breaking new ground applying genomics in this way and are building unique genomic-enhanced risk models as they go. “Our information will improve risk assessment models so that those who develop them can inform policymakers and forest managers in a more effective manner,” says Cooke. The move of the beetle into pure jackpine stands raises many new questions surrounding the struggle for survival involving pine trees, the beetle and the fungi. It introduces a large unknown into what scientists refer to as the perpetual ‘arms race’ that has typically occurred among these three elements as they co-evolved. Researchers are starting from a strong foundation because the Alberta Forestry Research Institute (AFRI), which is now part of Alberta Innovates Bio Solutions, recognized the threat posed by the beetle early on in 2006 and helped to initiate the research being done by Tria Project researchers at the University of Alberta, UBC, the Canadian Forest Service, University of Northern British Columbia, the Michael Smith Genome Sciences Centre, and the University of Minnesota. Because of that early support from AFRI, Cooke says that researchers have “irreplaceable biological knowledge from the early stages of an invasion process” that can now be used as a benchmark to track the evolution of the beetle, fungi and the ability of pine trees in various landscapes to withstand beetle attacks as the invasion progresses. Other supporters of the Tria Project include Genome Alberta, Genome BC, Alberta Sustainable Resource Development, and Genome Canada. There have been more than 85 students, postdoctoral fellows, technicians, and project managers associated with the project since its inception in 2007. For more information on the Tria Project, visit www.thetriaproject.ca or contact Dr. Janice Cooke at (780) 492-0412 or Janice.cooke@ualberta.ca. The Canadian Wood Fibre Centre (CWFC) can help landowners and investors develop sound business cases at a highly detailed level to grow short rotation woody fibre as a cash crop. CWFC and Canadian Forest Service researchers and their partners have spent more than a decade crunching the numbers and comparing input costs to output values from a national network of sites for both large stem high yielding afforestation as well as concentrated, short rotation woody fibre crops. It has developed tools, such as its biomass value simulation model, to evaluate the economic profitability of various scenarios. It considers all inputs such as the cost of establishing plantations, plantation management, harvesting costs, storage and shipping to production facilities, and production costs right through to the manufacture of the final intended product. They have also tested the value proposition for various potential final products using different short rotation woody crop scenarios, including conventional wood products, green energy, bio-fuels and other bio-products. “With most of our regimes, we have tried to put in a value to emphasize the cost-effective nature of these management regimes deployed on the landscape to entice landowners, investors and supporters to consider these new management options and applications,” says Derek Sidders, CWFC Regional Coordinator for the Prairies. For example, if the objective is to produce wood pellets, the CWFC is able to link the input costs of establishing a short rotation woody fibre crop for that specific purpose to the actual value that wood pellets have on today’s market, and help investors determine the best approach to develop a viable business case. “If we are going to get these new management regimes or practices adopted by final users, practitioners, industry, investors and landowners, we really have to prove and show that there are cost-effective treatments and management regimes that can be deployed on the landscape that make it worthwhile for the investors,” says Sidders. He adds that the short rotation woody crops not only have a value as a feedstock, but also represent a potential revenue source for landowners on the carbon offsets market. Suggested CWFC regimes on average will consume and capture 10 to 16 carbon dioxide tonnes per hectare per year. Liability costs related to carbon dioxide emissions in jurisdictions that limit or place a liability on carbon dioxide emissions are between $15 and $25 per carbon dioxide tonne. “That does introduce an extra value so that when landowners deploy a short rotation woody crop, it could without question make it cost-effective and competitive with other options,” says Sidders. When it comes to large stem high yield afforestation, CWFC can link the input costs of a typical 15 to 20 year planting rotation of specific clones of hybrid poplar and aspen to the value of end products such as oriented strandboard, lumber, pulp and paper, as well as bio-energy, bio-products and carbon offsets. With concentrated, high density short rotation woody fibre willow crops that have a rotation typically of three to five years, CWFC has developed regimes that tie input costs throughout the typical six or seven harvesting cycles landowners can reap from the same stump to the fibre’s output value as an alternative, for example, to coal or other liquid fuels to generate power and/or heat. If its use represents a reduction in the use of fossil fuels, these crops also have value on the carbon offsets market. To help encourage more uptake of growing short rotation woody crops for profit, Sidders hopes that more jurisdictions will consider adopting such initiatives as what Manitoba has done recently. It has invested $6 million to plant six million trees through afforestation on agricultural lands over a five-year period to reduce their provincial emission liability. Several forest companies are taking part in the program and have developed an operational plan to use the wood fibre to produce pulp, paper and energy. For more information regarding the options and opportunities of short rotation woody crops, contact Derek Sidders at (780) 435-7355 or dsidders@nrcan.gc.ca.